Back in 1980, I'd been hanging around the Chabad House at University of Michigan, coming to occasional classes and Shabbat meals. My first impression of the shluchim, Rabbi and Mrs. Goldstein, was they were kind and sincere, but not really my speed, as I was more into eastern and New Age spirituality. As I got to know them better, I started to sense a vibrant integrity and depth to them and their beliefs. Mid-summer, the Goldsteins started talking up a trip to their home base: the neighborhood of Crown Heights, Brooklyn. They wanted us to experience what is commonly known as “seven-seventy” because of its address: 770 Eastern Parkway. This sprawling group of Tudor buildings was the headquarters of their Chabad Chassidic group in New York. They must have spoken about seeing their Rebbe, but it washed over my head. I basically trusted them enough to go on a long weekend trip they were excited about. Why not? We were brought to 770,It was dramatically different from the elaborate temples of my youth a cavernous warehouse of a synagogue. With its worn-down wooden bleachers and zero frills, it was dramatically different from the elaborate temples of my youth, where style outshone function. Judaism was serious here; it was no spectator sport. 770 was nothing more than one big place where people could get on with the business of learning and praying. We women were directed upstairs to the women’s part of the synagogue. Since we were clearly visitors, people made room for us and guided us to the front so we could see through large, tinted windows. The women and girls crowded into this small place, where they prayed and learned with seriousness and strength. I gazed over the multicolored, taped-up flyers that filled the walls of the narrow passageway. Some were carefully typed and illustrated, others scrawled with a foreign hand and spelling. They silently told the tale of this community’s concerns. Apartments for rent; babysitter needed; warm, loving playgroup forming; discount tickets to Israel; furniture for quick sale; couple leaving for a post in Asia; study and prayer group meeting; classes and lectures. Prayerbooks filled the bookshelves and were piled up on the bleachers. 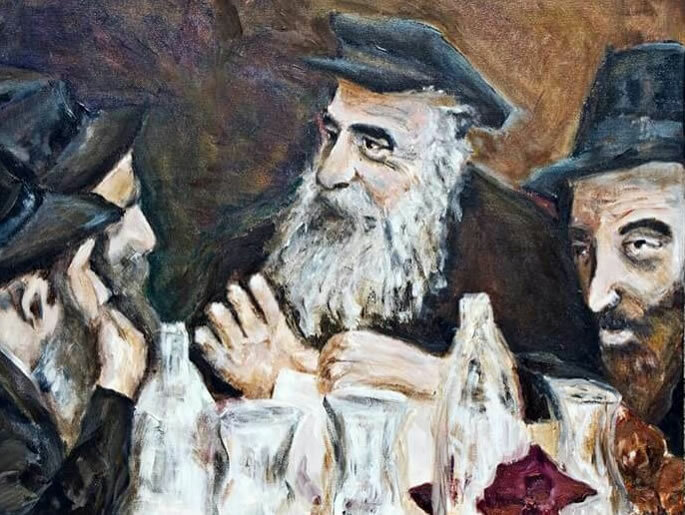 Tomes of Torah were taken in and out of the shelves, learned singly, by pairs huddled together on the wooden benches and in occasional lectures that seemed to spontaneously take place in one of the three sections of bleachers. Someone stood to teach, and a crowd would gather around. A medley of languages could be heard: Hebrew, English, French, Russian, Yiddish. These were the primary tongues, but a smattering of others were also discernible in this mini-ingathering of Jews from around the globe. A few young women glared at us newcomers with penetrating stares, looking us up and down. I unconsciously smoothed my clothes and hair. Some gossiped and laughed loudly; many murmured prayers with force and vigor. Not too many wilting wallflowers up here. There was an air of intent and purpose. These Chassidic women and girls were fascinating, paradoxical. I stared, trying to figure it out. What was the deal with them? Most were quite feminine: made-up, bedecked with jewelry and looking good. But at the same time, they were strong and confident. I had come to equate femininity with being weak and passive, so much so that I eschewed pink and lace in favor of army pants and hiking boots. A unique panorama unfolded in the men’s section. We peered through a large plate-glass window that looked out over the sea of men and boys one floor below us. They ranged from dewy-eyed toddlers to dignified elders, whose intense character could be seen in every gesture. One gentleman caught my eye; he had a peasant’s cap and an intense expression, spiritual yet earthy . . . earnest. I found out that this man, Mendel Futerfas, had been imprisoned in the Soviet Gulag for some 20 years. His lively spark shone; it didn’t seem snuffed out or dimmed by his suffering. The bulk of the crowd was young men and middle-aged working family men. A sea of black hats, beards, glasses. A hum of laughter and conversation filled the chamber. Waves of song washed across the room. I was amazed to see hugs, affection, kisses, even as friends greeted each other—close body contact without so much male armor. These gentlemen were dedicated husbands, fathers and grandfathers, responsible for growing tribes. They let themselves be corralled, roped, and committed to their wives and families with a beautiful soft manliness—a beautiful manly softness. Suddenly, the enormous room, the thousands of people, became silent. A singular focus and intense anticipation filled the space. The mob parted, a path opened, and a white-bearded man walked briskly to the front. He wasn’t showy or ostentatious; he radiated intensity and focused strength. And not just because ofI was fascinated, transfixed the dedicated throng. I could have rattled off a whole pantheon of assorted spiritual teachers who had followers. Somehow, in those few seconds, from my distance up in the women’s section, I could sense a deep and unshakable authenticity—the lack of that blasted ego the others professed to have attained—along with dynamic perceptive intelligence, something rock-solid and profound. The Rebbe sat in front of the crowd in the middle of a long table covered with a white tablecloth. He spoke in Yiddish in a sing-song cadence—in a strong and earnest voice that hit me in my heart. Silence reigned in the enormous crowd. Most stood still; some cocked their heads; others swayed in concentration. The talks, each segment lasting a half-hour or so, were punctuated by rousing song. Thousands sang together, heartfelt nigunim (Chassidic melodies)—some with words, some pure yearning and wordless. Like the Pacific Ocean, waves washed in tireless rhythm. They were waves of intense melody washing across the room, transporting us from a warehouse filled too tight with people under glaring fluorescent lights and carrying us to a timeless soul place. We took it all in as best we could for a while; an hour or two sped by in the suspended, primordial time. Afterwards, our group wandered out to meet by a street corner. We were hit by a barrage of cars honking and speeding, jarring commotion on noisy Eastern Parkway. “Whaddeya think?” Josh asked me. We just stood there for a few minutes, lingering, not quite ready to break the spell of that different, deeper, vibrant world—that strange universe behind the heavy wooden doors. We weren’t quite sure what it had to do with our lives back in Ann Arbor, Michigan, but something real and compelling had touched us, and was resonating in our souls. Miriam Karp is an award-winning writer, artist, Judaic studies teacher and lecturer. Her paintings explore intimate moments in Jewish life. Miriam lives in Cincinnati with her husband and family. This essay is excerpted from her first book, Painting Zaidy’s Dream: A Memoir of a Searching Soul. Susan, I'm so sorry you miss the point of separation of men and women which is so beautifully made by Miriam Karp. She didn't seem to experience being 'relegated' to second class. I guess she was open to experience the moment free of any agenda or preconceptions getting in the way. When I'm at a shul with a kosher mechitzah (separation) I'm thinking about davening (praying). I appreciate having the protection from men looking at me. Why do you think this makes the women "second class citizens"? The women don't have the same restrictions as men. Are men being treated as second class or is Judaism just recognizing that men are easily distracted.